Ontogeny of behavior is the origin and development of the behavior over an individual’s lifetime. First, before we think about how this behavior has developed, the life cycle of the praying mantis must first be drawn out. Pregnant females, in the fall, find a flat surface or a plant to lay her eggs on. 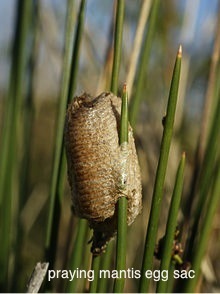 The eggs are contained within a hard protective casing called the ootheca. The eggs develop within the ootheca throughout the winter. 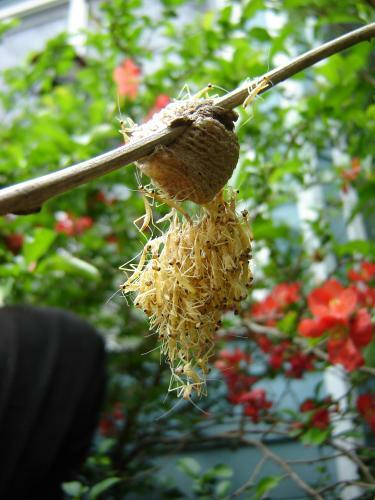 During the spring, the ootheca opens and releases the praying mantis nymphs. The nymphs remain in the vicinity of the ootheca for a short amount of time before dispersing. The nymphs continue to mature and molt until they reach their adult size at the end of summer. During this time period, the praying mantises live completely solitary lives, only coming back into contact with other individuals during the mating season (late summer to fall). Praying mantises only live for 6 months to one year, depending on the species, and thus only see one mating period. Determining the ontogeny of sexual cannibalism involves determining whether the individual must learn the behavior or whether the behavior is innate to the organism. No current research has been done on whether sexual cannibalism is a learned or innate behavior. Although no research has been done on the topic, praying mantises do not invest in parental care and individuals live alone for most of their life outside of the mating season, insinuating that the behavior may be innate. Though if sexual cannibalism is an innate behavior, studies would have to be done to determine what factors influence the occurrence of the behavior, since sexual cannibalism does not occur during all matings. Starvation: Researchers have found that hungrier praying mantis females will cannibalize their mates more often than less hungry females (Birkhead, Lee, and Young, 1988). Another study found that starvation is a more important indicator of whether the female will participate in cannibalism than the extent of male display (Kynaston, McErian-Ward, and Mills, 1994). This evidence supports the foraging strategy hypothesis, which argues that sexual cannibalism gives the female much-needed nutrients that increase her fecundity – the ability to produce more and healthier offspring. Role of Courtship: Although previous research has found that starvation is a more important predictor of cannibalism than length of male display, researchers have found that the male display has an effect in decreasing female aggression and thus reducing the chances of cannibalism (Liske and Davis, 1987). Season: Many researchers have hypothesized that if sexual cannibalism is a weighed choice between the value of the male as a mate and as food then the reduced availability of males should decrease the probability of sexual cannibalism. Although it has been found that as the mating season progresses, the female:male ratio increases as the population of available males decreases (Maxwell, 1998: “Seasonal”), no conclusive evidence has been found that season (and thus the availability of a mate) has an effect on the incidence of sexual cannibalism.